I previously and briefly explained the concepts of the Aries Point for those who are unfamiliar with that term. Today I will give a deeper explanation on configuring a dial which makes the Aries Point easy to see. This wheel system is very old and it is the most widely used. In Hamburg, Germany starting before World War I and between World War I and II they developed a whole new system using things like Midpoints and Sums. This new technique has been adopted by many western astrologers today as it is an easier way to read all the many asteroids and Transneptunians, (TNPs) we now work with. Astrologers who work with asteroids will work with thousands of them in their research. The asteroids for this kind of astrology represent “all the details” but the sheer number of them is daunting. We presently have more than 20,000 named asteroids presently and that number is still growing. Asteroid studies in general are growing among astrologers due to the amazing detail they can provide. Before the asteroids were available there was a great deal more “intuition” used to describe a situation. With the asteroids there is no need for guessing or intuition as they can provide those details. In future articles I will discuss more of those “little rocks” I depend on as an astrologer. Now we will focus on the tool used to read just how those asteroids are affecting us. In Hamburg, Germany they still use the “360 degree” dial. 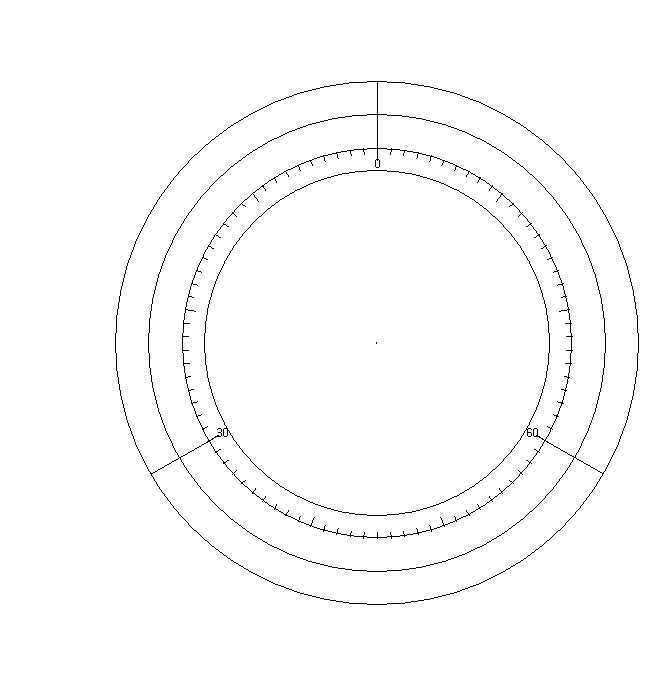 This is a dial that is set up like a circle using 360 starting with 1 degree Aries and goes around all signs until the end 30 degrees of Pisces. Here in the US most of us tend to use the “90 degree” dial. This dial takes the 360 dial and folds it into quarters. This is the one I will explain in greater deal here. Unlike a wheel which is different for each person, a dial is one set up they are all the same, whether we are talking about the 360 dial or the 90 degree dial. It is the material you put in them that will make them different. The top of a dial is always the Aries Point. It represents all the 0 degree cardinal points. This was explained in my previous article—cardinal points of course being Libra/Aries/Capricorn/Cancer. The first 30 degrees as we circle down from the left (counter clockwise) represent the rest of the cardinal signs and their degrees. If we look then at the 10 degree placement on the dial it would again represent all the 10 degree points for all the cardinal signs. The following 30 degrees (bottom of dial) represents the fixed signs of Leo/Aquarius/Taurus/Scorpio. The final 30 degrees (up the right side of the dial) represent all the mutable signs which are Gemini/Sagittarius/Pisces/Virgo. If you have ever been or are a student of astrology you will immediately realize on the dial Conjunctions, Opposites and Squares will all show up together. This greatly helps the astrologer to “see” visually where the astrological activity and interesting conversations are happening. Significantly, anything that is grouped together on the dial and is within 2.5 degrees is “in conversation” BUT so are those, planets/TNPs/asteroids that are directly across the dial from that point. An added extra point that is also considered important to the whole conversation is the 22.30 degree point. Simply put if you split 90 degrees into four parts you will come up with 22.30 degrees. This completes the axis of the conversation. For newer astrologers this can be a bit complicated and even overwhelming, yet those 22.30 degree points as well as the 45 degree points all represent aspects that a traditional wheel astrologer would have had to do math to figure out. The dial makes doing math obsolete. This is very helpful! Look at the sample dial I have included for this article. For all those who have their own Astrology Software does yours give the option for dials? Can you see each 30 degree section? From 0 counterclockwise (the Cardinal Signs), the bottom starts at 30 degrees, (the Fixed Signs) and up the right side starting at 60 degrees, (the Mutables).